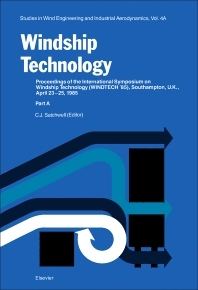 Windship Technology, Part A contains the proceedings of the International Symposium on Windship Technology (WINDTECH '85), held at the University of Southampton, England, on April 24-25, 1985. The symposium provided a forum for discussing developments in windship technology, including the use of calculation methods to analyze wind propulsion on cargo ships and weather routing for wind-assisted ships. Measurements of the comparative performance of sailing rigs are also presented. Comprised of 17 chapters, this volume begins by tracing the revival of serious interest in the possible use of the wind in ship propulsion over the past decade, and giving examples of the wide range of rigs that have been developed and are now installed on ships. The reader is then introduced to Project INDOSAIL intended to develop cargo sailing vessels for the Indonesian inter-island trade. Subsequent chapters focus on sail-assist developments from 1979 to 1984; economic aspects of the application of additional sail power on small German fishing vessels; sail retrofit on inter-island vessels in Fiji; and the aerodynamics of a triangular jib-and-boom combination. The book concludes with an evaluation of two-dimensional sail shape determined by pressure and its tension. This book will appeal to government officials, academics, ship owners, and other parties with an interest in windship technology.